IT's time now to call and BECOME A FESTIVAL SPONSOR! Call NOW to be a sponsor for our next Film Festival! Thank You to all those who helped sponsor our very successful prevoius Festivals! 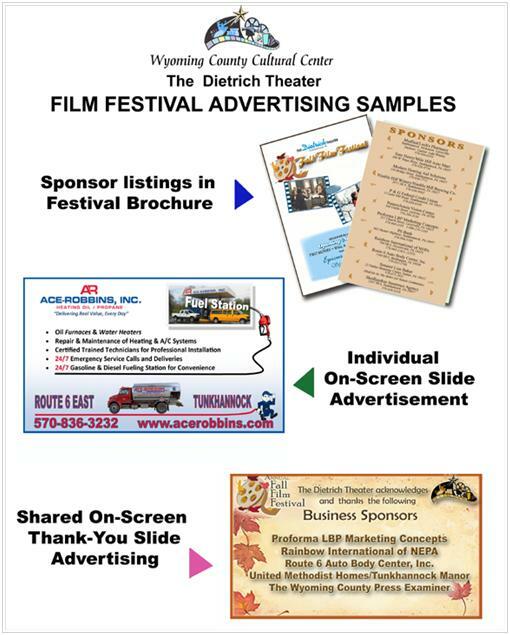 It's not too early to consider becoming a sponsor for our SPRING FILM FESTIVALThe Dietrich Theater strives to showcase the year’s best foreign and independent films. This festival brings over 5,000 moviegoers to our theater from the Wyoming Valley and beyond. This unique event showcases our area and offers tremendous exposure for our sponsors. We hope that you will help us underwrite these spectacular events by becoming a festival sponsor. Sponsorships are available at $100, $175 and $500 levels. The enclosed form and advertising samples explain each sponsor level. If your sponsorship includes an on screen ad, over 5,000 people in the festival theater alone will see it. Your ad will also be showing on three other screens, all of which will be playing top-notch commercial films. And, unlike print ads, which are often glanced at if they are seen at all, ads on the movie screen are intently watched while the audience waits for the start of the movie. Our audiences usually come early to get the seat they want and while watching the ads often make commentary about them with their companions. You will never get this intense ad scrutiny in a print ad. The Dietrich Theater is unique and fun, and most importantly, watched by thousands of potential customers. The Wyoming County Cultural Center/Dietrich Theater is excited to provide this level of culture to our community. We hope you will decide to support us for one of the most popular events at the Dietrich Theater. Call Shirley Fisher at 570-996-1507 for information about becoming a sponsor.